Unpiloted Daedalus star probe design was the output from a British Interplanetary Society study completed in the late 1970s. Newtechnologies and the growing number of alien planets being discovered arefueling a new look at a plans for a futuristic interstellar probe into deepspace. Adedicated study team has formed Project Icarus, aninternational initiative established by the Tau Zero Foundation in the UnitedStates and the British Interplanetary Society (BIS). Themulti-talented group is delving into everything under our the sun to developdesigns for the interstellarspaceship, from inertial confinement fusion to reviewing the latest in nanotechnology, computing, and electronics, as well as identifyingtarget star destinations. Today?sProject Icarus signals a bit of a baton-passing froma BIS-backed star ship appraisal called Daedalus thatwas done in the late 1970s. ?The Project Daedalus theoretical engineeringdesign study took place over three decades ago. In the time since, there havebeen many advances in science and technology,? said Kelvin Long, a key Icarus designer. ?There is a need to maintain interest in and the capability to designinterstellar probes,? Long told SPACE.com. ?With many of the historical leadersin this field now nearing retirement or deceased, the Project Icarus study group wants to take up the baton and keepalive the long term vision that travel to the stars will one day be possible.This is one of the reasons why over half of the team is relatively fresh out oftheir university studies.? Designing an unpiloted Project Icarus spaceprobe is requiring the time and energy of some 20 volunteer designers. Takingon interstellar travel this 21st century go-round is estimated to consumearound 30,000 man/woman hours of effort, with submission of the final studyreports due for 2014. Many of the original Project Daedalus studyparticipants are providing guidance. Long said that Project Icarus is an exercisein theoreticalengineering to the extreme. Project Icarus, hesaid, will take another look at several of the Daedalusassumptions and systems. Furthermore, an objective of the initiative is tocontinue to inspire the next generation. ?Icarus may not be the blueprint for how wefirst reach the stars, but it is hoped that it will be an importantcontribution towards this long term goal. Another purpose of Project Icarus is to remind space agency mission planners to thinkoutside of the box,? he said. The intellectual thrust behind Project Icaruswill measure, for one, the technological maturity of fusion-basedpropulsion schemes. Key technological stepping stones are to be identified.In short, a long-haul roadmap to the stars is on the group?s to-do list to makesuch a mission possible. ?This would provide an estimate for the earliest time upon which such amission could be launched. This may be in the latter part of this century,sometime in the 22nd century or even later,? Long observed. 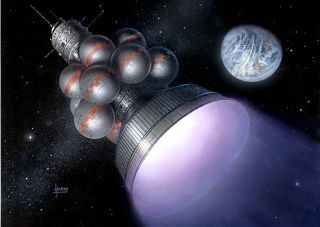 The Project Daedalus effort of decades agoproposed mining Helium-3 (He3) from the gas giant Jupiter which necessitated amassive space based infrastructure. Fast forward to today means that the Project Icarusgroup will re-evaluate this fuel acquisition tactic and consider alternatives -such as mining He3 from Earth?s moon or exhume deuterium from objects inthe Oort cloud. Moreover, the assumed Daedalus propellant combination of deuterium and He3 willalso be re-examined, as will implosion-driving schemes. Long said that the choice of mainly fusion-based propulsion for theproject was made because it is believed to be one of the strong candidates forhow the firstinterstellar missions will be achieved in future decades or centurieshence. ?There are other proposals which are credible, such as solar sails...butfusion certainly offers the required performance for an interstellar mission,provided you can make the technology work,? Long noted. Project Icarus aims to build on the first-rate work of Project Daedalus, by refining the design with updated knowledge inscience and technology, he said. ?Primarily, we have over thirty years of new data on experimentalfusion, and thus have a deeper understanding of the process,? said Richard Obousy, primary propulsion lead of the study group. Possibly one of the most exciting advances, he said, is the suggestionthat antimatteritself, in very small quantities, could be used as a catalyst for fusionignition. ?All these technologies could certainly optimize the original Daedalus design, meaning less mass for the propulsionsystem and more possibilities for the payload. We hope our study will result ina faster and less massive design,? Obousy said. Given the gulfbetween our solar system and another star system, long distance datatransmission from the Icarus probe is a tricky issue. According to theteam?s communications lead, Pat Galea, solutions range from examining the potential for powerful lasers tobroadcast data back to Earth, to more exotic ? but physically plausible ?mechanisms, such as using the sun as a gravitational lens to focus the distanttransmissions onto a deep-space receiver craft. ?We are aiming for a technically credible solution for Icarus,? Galea added, ?so there?sa lot of model building and number crunching ahead before we can decide on theoptimum solution.? With the onslaught ofexoplanet detections, with far more to come, what?sthe most suitable target for the first mission of an interstellar probe? Long responded that EpsilonEridani, 10.7 light-years away, is a goodcandidate as infrared observations have detected dust rings suggestive of aplanetary system. ?Ideally,we would like to identify Earth-like worlds in the habitable zone and this isan ongoing research program in the astronomical community,? Long pointed out. ?However, the choice must be balanced with engineering design constraints andwhat is realistically possible within a 100 year mission, one of therequirements for Project Icarus.? ?Itis about time to put some systematic work into assessing to what degree theadvances since Daedalus have made interstellar flighteasier ? and to recheck where we stand today ... and what we need to do to makeprogress,? said Marc Millis, President of the Tau ZeroFoundation, based in Fairview Park, Ohio. Millis is an Icarus consultant and formerproject manager of the NASA Breakthrough Propulsion Physics Project at thespace agency?s Glenn Research Center in Cleveland,Ohio. ?Consider what will happen when the firstEarth-like exoplanet is discovered. We cannotreach such a place with the technology and science we have today. Thatdiscovery will likely spur a renewed spirit of adventure to push the edge ofknowledge to create such transportation abilities,? Millis said. ?And that iswhere my cohorts and I are?looking beyond the obvious next-steps for the hugegains that will change everything ? and having the patience to teach thelessons along the way.? Leonard David hasbeen reporting on the space industry for more than five decades. He is pasteditor-in-chief of the National Space Society's Ad Astra and Space Worldmagazines and has written for SPACE.com since 1999.